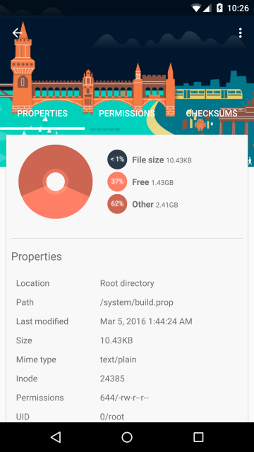 Easily edit your build.prop or any other properties file on your Android device. BuildProp Editor comes with an intelligent code editor with syntax-highlighting for multiple languages. Auto backup your build.prop file before any modifications are made. Restoring backups are easy and reliable. Get detailed information about system properties, including where they are used in the Android framework. Easily share your build.prop with others via NFC or uploading it to Dropbox, Google Drive, or other cloud storage apps. All system properties are categorized in groups. This simplifies finding and understanding what a property does. Enjoy a beautiful and friendly user interface that closely follows material design guidelines. You can customize the look of the app in settings. The app is published by JRummy Apps Inc. — a trusted company with over 40 million installs from several root related apps on Google Play. BuildProp Editor was the first app of its kind. It is the top ranking build.prop editor. Over 1 million Android users have downloaded the app to tweak their rooted Android device. Whether you are an advanced root user or a newbie, BuildProp Editor is the perfect tool for tweaking your rooted Android device. 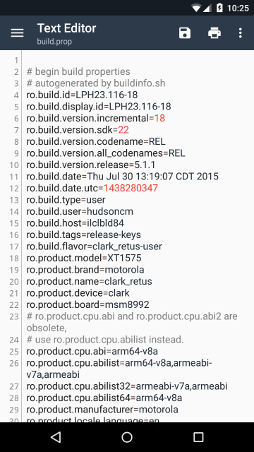 To see a full list of system properties used in the Android framework click here. Device manufacturers add their own system properties and may change the behavior of system properties on your device. To get a list of all system properties on your device you can run adb shell getprop from the command-line. Backups are saved in the application’s private data folders. You can change the backup location in settings. To create a new backup open the navigation drawer and select “Create backup” from the menu. The property name can be a maximum of 31 characters long. The maximum property value is 91 characters. The property’s value can be a string, a number or a boolean (true or false). Values 'n', 'no', '0', 'false' or 'off' are considered false. Values 'y', 'yes', '1', 'true' or 'on' are considered true. Your device needs to have root access to modify the build.prop or add a system property. 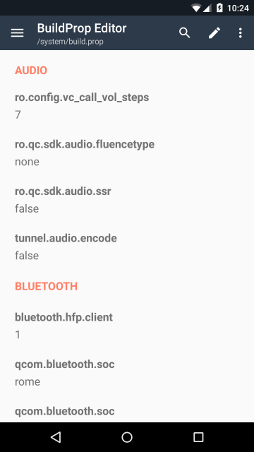 However, you can still use BuildProp Editor to view device information and create a backup of your build.prop without root access. You can learn more about rooting your device here. Why does the app request X permission? INTERNET & ACCESS_NETWORK_STATE: These permissions are used for crash reporting services and analytics. WRITE_EXTERNAL_STORAGE: This permission is used to allow you to change the backup location to your SD card. NFC: This permission enables you to transfer the build.prop file via NFC to another device. Copyright © JRummy Apps Inc.